Both of my sisters, one older than me and one younger, now live in California. Jane transplanted after living much of her life in Portland, OR. Teri lived for many years in New York before relocating to San Francisco. Through the moves, they still have their art given to them by our mother shortly after she was diagnosed with cancer. 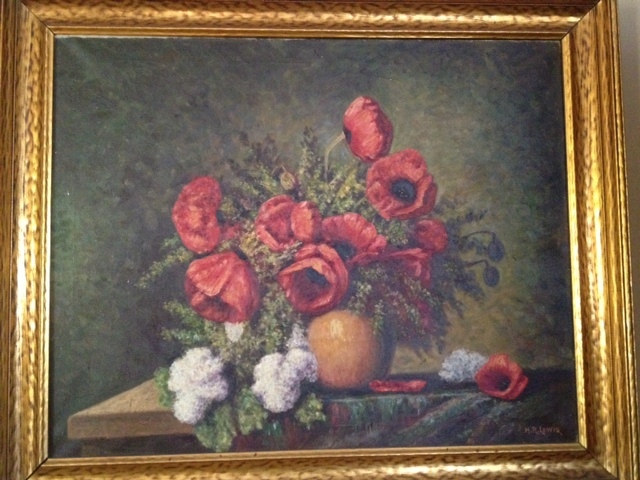 I recently acquired a print of the painting Poppies painted by our great-grandfather, Hubert Lewis. I remembered seeing that painting at some relative’s home, but I just couldn’t quite remember whose. Then my sister Jane sent me emails yesterday with her pieces from H. R. Lewis and, lo and behold, there was the painting of the Poppies! I’m not sure how I forgot that I grew up with it, especially since I like it so much. 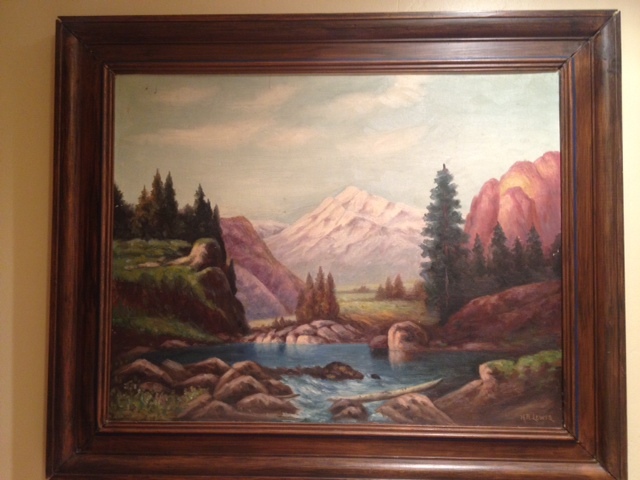 The other piece, a landscape with a crisp lake in the foreground and a snowy mountain in the background is signed H. R. Lewis, as is the Poppies painting. Teri sent me her photos, as well. She received the chalk of our grandparents, Hazel and Alexander P. Rogers. It looks so much like a photo with it’s detail that one way to know it’s a chalk is because it’s in color, whereas photos back then were only in black and white. 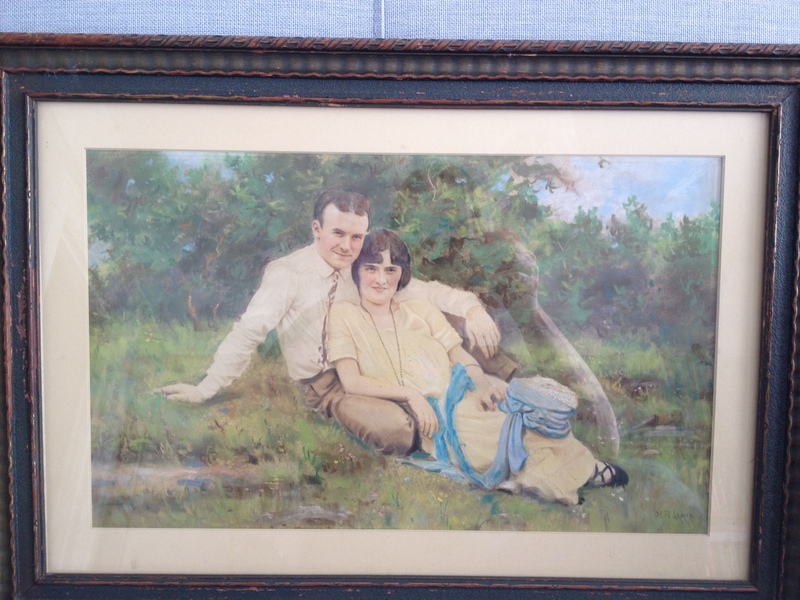 I estimate it was done in the early 1920’s because they were married in September of 1924. I don’t know if it was taken before or after they married. Grandma would have been in her early 20’s to mid-20’s since she was born in 1900, and Grandpa was probably in his late 20’s or early 30’s since he was born in 1895. Teri’s other painting she called “Fruity Lewis” is a basket bursting with strawberries and bananas are next to the basket on a plate on the table. A few pieces of my great grandfather's work were always in display at our home growing up. In fact, every relative it seemed had his art hanging. One day I wanted to find out more about him, and it seemed there was no compilation of information in any one place, and there was some confusion about who H Lewis was. So I started digging and it led me to be the one to compile information from several different places, with a lot of the information coming from relatives who had stories handed down to them. I also searched records and collected art. Please fill free to contact me regarding information about Hubert Lewis. This entry was posted in Family, The Art and tagged 19th century art, 19th century artist, American artists, Apollo, art, Grandparent, H Lewis, h. lewis signature, H.R. Lewis, Henry Lewis, HR Lewis, Hubert Lewis, Hudson River School, Jane Kent, Kim Lawler, Painting, Pastel, Pennsylvania, Pittsburgh, Teri Cavanaugh. Bookmark the permalink. 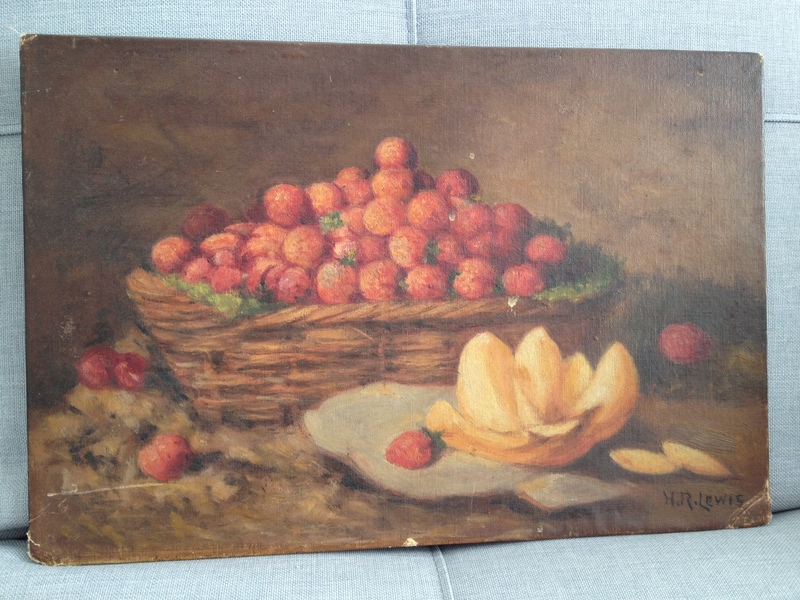 I recently purchased a painting at the flea market by H. R. Lewis (signed) and was wondering if you knew anything about it. the painting is a vase of flowers. it looks very old. and will be available in book form within about two weeks on Amazon.com.